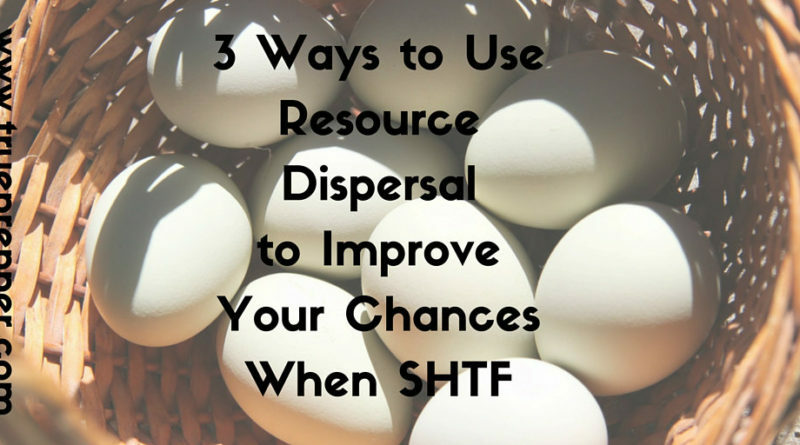 Resource dispersal is an important part of prepping that is often underrated and overlooked. Between redundancies, caches, and bug out locations, you can improve your odds when the unknown and unthinkable is happening. We know prepping can be expensive. Multiple disaster kits and bug out bags may seem too costly to many preppers, but having duplicate kits stored in separate locations in your home can greatly improve your chances of survival. If the part of your home where all your preps are stored becomes compromised, the results could be disastrous- even for a prepper. Even if you do not have redundant kits to due space or cost, splitting up the stores that you have can help. I know preppers that keep all their food stores in their garage. In the event of a hurricane, if a tree fell on that garage they would be ‘up the creek.’ Spreading out your storage areas is necessary to truly be prepared for the worst case scenarios. Using caches for small or large survival gear is a great way to disperse your resources. Survival caches are the ultimate tool for resource dispersal because they are versatile and usable five feet from your home or 50 miles. A good mid-size survival cache could be the difference maker in a SHTF situation. You can store ammunition, maps, personal information, money, and tools in a cache which all could provide aid when you need it most. Make sure you stash some desiccant in the survival cache as well to prevent moisture build up. Bury or conceal the cache in an easily accessible location that is not visible or well traveled, so you can avoid having someone loot your cache. Burying a cache in your yard may be an option as well, in case your home is compromised in a disaster or emergency. Redundancy in caches can also help, since you can easily set up several small caches for relatively cheap. Having a bug out location with resources can greatly improve your ability to contend with geographic threats. Without at least one bug out location, or multiple locations, you may find yourself hard pressed to survive when a regional catastrophe occurs. While you can learn skills to become completely self sufficient, resources are always good to have and bug out locations can provide places to store those resources. Many preppers turn to the wilderness away from many natural and man-made threats. Distance from nuclear plants, military facilities, as well as natural disaster history can go into consideration when selecting a location. BOLs don’t have to be cabins that you purchase in the backwoods- friend and family locations in different geographic regions can work as well and do not require purchasing property. Be sure to have a conversation with them regarding what and how much you store at their location- and be sure to include them in your preps if they are not preppers on their own. You may lose some stored preps, since we cannot control every situation no matter how well prepared. The purpose of resource dispersal is to make it so only a fraction of your survivability is hurt from any one kit being destroyed. Hopefully these three points have allowed you to pause and examine your own plans and how you store your prepping gear. Disperse your preps, and don’t put your eggs all in one basket.